Changing the opening hours from 8am to 7am has the potential to prevent Bike vs Vehicle Collisions and Near-Miss Collisions. We believe that the ultimate goal of preventing Bike vs Vehicle Collisions, and the potentially fatal consequences thereof, more than justifies opening the Park to cyclists and hikers at 7am! Many cyclists and hikers would like to enter the park at 7am for a variety of reasons. Some want to get in a ride or hike before going to work, while others would like to commute to work through the park. Others want to beat the heat during the summer months. Many want to get their ride or hike started before the park roads get crowded on weekends. Mount Diablo Cyclists support these riders and hikers. Not only do the individuals benefit by earlier access, but the Park benefits by reducing Bike vs. Vehicle collisions and Near-Miss Bike vs. Vehicle Collisions. The posted park opening hour is 8:00 am. Often, park gates are opened before this time. 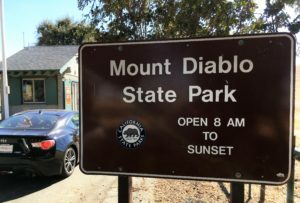 The Supervising Park Ranger has told Mount Diablo Cyclists that “he considers the park open once a gate is open. If you get there before 8 and the gate is open, you may enter the park.” If the gate is closed and you enter, you may be stopped by a ranger. Review of 80 of 280 State Parks shows that many open at sunrise or 7am. The Park Gates (North & South Gate) are typically opened daily 7am – 7:15am by Park staff, spouses/partners entering/exiting the Park. A Ranger is on duty at 7am every day. All six Rangers live in the Park. The majority of cyclists and motorists visit MDSP on weekends. Significant numbers of motorists usually enter the Park around 10am. Significant numbers of cyclists like to enter the Park early, before the roads become crowded with vehicles. Park policy now requires that the Verbal Motorist Safety Advisory begiven to all drivers entering the Park. This safety message is vital, but can only be provided to a driver if there is someone stationed at the entrance kiosks. For years, the kiosks at North and South Gate have been staffed less than 50% of the hours that the Park is open. Therefore, many motorists never hear that message. Consequently, they pass cyclists on blind curves, unwittingly causing a near-miss or an actual head-on collision. We have met with Park and District Leadership since 2015; requesting MDSP open at 7am. Another option we discussed with Park and District Leadership since 2015 is to allow hikers, joggers and cyclists to enter the Park at 7am and open the Gates at 8am for motorists.